The Wild Photographer: Vermilion Flycatcher - Warning Colors? 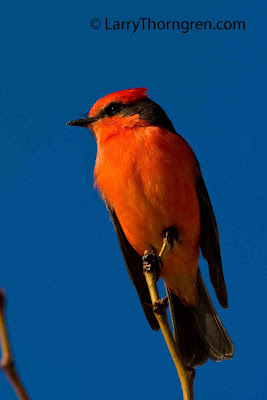 Wow this vermilion flycatcher has such attractive color..There is no wonder that hawks and falcons can find this bird easily..Thank you for this nice post. I have observed quite a bit of vermilion flycatcher behavior in Tucson, AZ. I think they are a bit too small for those birds. I have never seen a raptor go after this bird. As a matter of fact, when a raptor comes by (usually a Cooper's Hawk in this case) during nesting season, I have seen the male Vermilion rise into the air in full display mode as if to diver the hawks attention from the nest. The hawk seems to ignore it. I have seen sharp- shinned hawks dining on Juncos and a Kestrel pulling young sparrows out of their nest and eating them. These birds are just as small as the Vermillion Flycatcher.